Zed’s Dead is an online arena shooter, where two teams of players face off against each other in various isometric city and town maps, scoring points by shooting each other, capturing each others’ bases, and through other tasks. 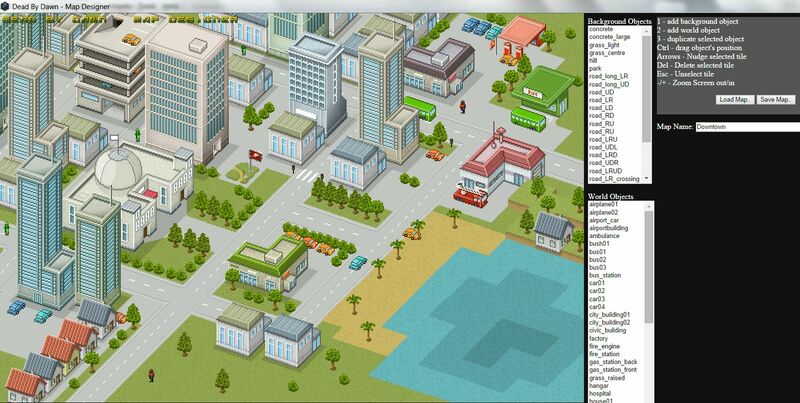 Players can search cars and buildings in order to find weapons, ammunition, food, medkits and various powerups. The game also features hordes of zombies, who are not on anyone’s side but who attempt to eat whoever they can catch. The zombies act as a challenge and a strategic element to use while combating your human adversaries. Currently, the only game mode is ‘Open Access’ team-v-team combat, with game length fixed at 15 minutes (it ends earlier if either team base is destroyed). Players can drop in and out at any time. OK, so there was this biological warfare experiment that went wrong. The head science guy running the experiment was called Zed. Before you know it, there’s thousands of brain-dead infected people swarming everywhere trying to eat people. We call these zombies “Zed’s Dead”. The zombies act as obstacles (or opportunities?) during the core player-v-player game, rather than being the primary challenge. WASD or Arrow Keys to move; point and click with the mouse to fire. TAB to open/close in-game chat. F1-F3 to use equipment. F4 to access the level-up panel. Stand by a doorway, car, etc. to search it. The chance of finding stuff depends mostly on your character’s “searching” skill. If you start shooting while searching, your search will be much slower. For the moment, all games are hosted on the psychicsoftware server, and there’s just one map (“airport”). The plan is to have player-hosted games too, and these will be playable on any maps that the host has made. Player-designed maps can be submitted for consideration to become official maps. As well as ‘test’ combats on player maps, there are also a number of continuously-running ‘Open Access’ combats, which let players log in and join at any time. Upon joining a game, players start with inexperienced characters – they level up the characters through play. As well as leveling up characters in a single play session, players also unlock various characters over a longer time period. Daily and all-time high score tables are maintained for each ‘Open Access’ combat game. The final game style will be a formal team-v-team ‘MOBA-style’ arena, in which teams of 4 players attempt to destroy each others’ base to win the game and gain ranking points. Teams can be randomly assembled or pre-assembled by groups of friends.